Unfortunately, I didn’t get a chance to take a picture of this soup, but there is a good reason – it got eaten too quickly! This is an easy soup to put together, and ready in about a 1/2 hour. Heat olive oil in a large pot over medium-high heat. Add onion, carrots, and celery, and cook until softened. Pour in the beef broth and diced tomatoes. Bring to a boil for about 5 minutes. Add meatballs and boil another 10 minutes. Stir in uncooked pasta, garlic salt, and ground black pepper, and cook for 6 minutes. Reduce heat to medium and cook another 10 minutes, or until pasta is tender. Stir in parsley. Serve hot. Makes 4 servings. I had tried a lentil salad from a local vendor, and decided I wanted to try and make my own. I usually use lentils in soups, so I was excited to try a salad. 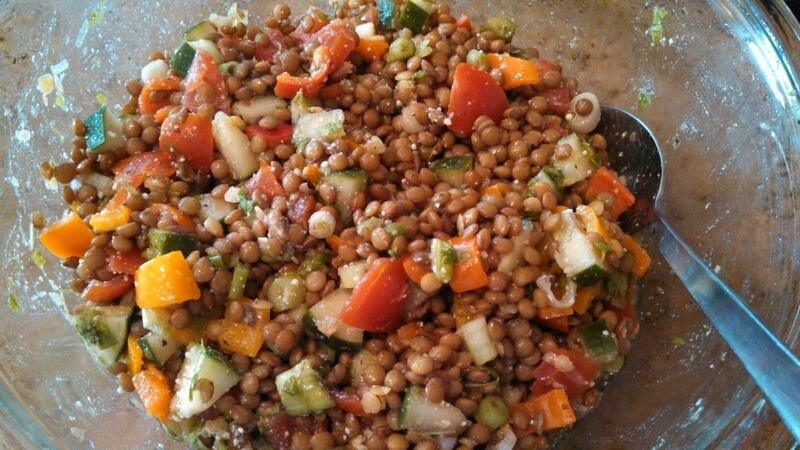 Like pasta salad, Lentil Salad could be done a ton of different ways. I’m already thinking about what combinations to try next, like maybe tomatoes, olives, and feta cheese. Plus, lentils are very good for you too. Always great when something tastes good and is good for you! Rinse lentils and drain. Place lentils in a medium sauce pan with 3 cups of water. Bring to a boil, then reduce heat to simmer. Cover and cook for 30 minutes, or until lentils are tender. Drain. Run cold water over lentils and drain. Allow to cool for a few minutes. Place cooled lentils in a large bowl. Add peppers, cucumber, tomatoes, green onion, parsley, and Parmesan cheese. Mix together. Whisk together olive oil, red wine vinegar, garlic powder, Italian blend seasoning, salt, and pepper to make the vinaigrette. Pour the vinaigrette over the lentils and vegetables. Mix in well to fully coat. Cover and refrigerate before serving. After attending the Taste of Home Cooking School show and watching these being made, I have wanted to try this out. The stuffing is all ingredients I tend to always have on hand, and then when I got mushrooms in this week’s Bountiful Baskets, I knew it was time to make them! I only had 3 packages of mushrooms and ran out of mushrooms before running out of stuffing. I had thought this stuffing would go great in crescent rolls too, so I got out a can of crescent rolls to finish up the stuffing. Both were great and well received by my family (minus my 3-year-old who did not eat any because she is sick). Preheat oven to 400 F. Line 2 baking sheets with foil. Remove sausage from casings. Place in a skillet over medium heat and crumble. Cook until no longer pink and drain. Stir in bread crumbs. While sausage is cooking, mix together cream cheese, parsley, lemon juice and garlic. Add sausage mixture to the cream cheese mixture. Fill each mushroom or crescent roll with the stuffing. Lay out on the baking sheets. Sprinkle with the grated Parmesan cheese. Bake for 14 to 16 minutes, or until mushrooms are tender and lightly browned, or until crescent rolls are golden brown. 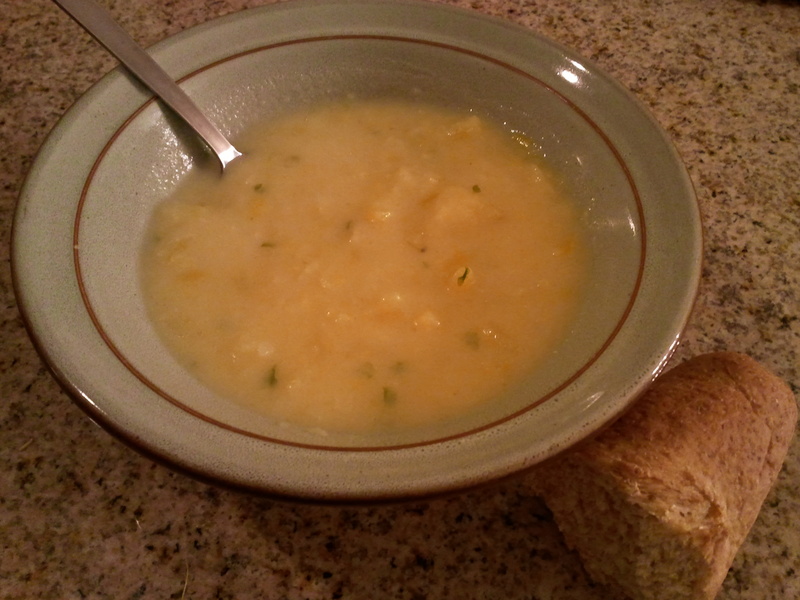 I have eaten Potato Leek Soup before, but it was a store bought soup mix. I have never actually cooked with leeks, so I was excited to see them in my Bountiful Baskets this week while most people were turning up their noses at them. Plus, we also got gold potatoes, so Potato Leek Soup had to be made! My husband was really excited too, and he really enjoyed the soup. It also worked out that Saturday was an overcast, rainy, cooler day, great soup weather. And, it was coupled perfectly with the baguettes I had gotten from my Sunizona Family Farms FarmBox. Can you tell how excited I am about how well this meal came together?!?! Melt butter in a large stock pot and add chopped leeks, plus salt and pepper to taste. Cook leeks in the butter until tender, about 10-15 minutes. Do not let leeks brown, brown will give them a burnt taste. Next, wisk the cornstarch into the chicken broth, leaving no lumps. Pour into the stock pot. Then, add the diced potatoes and half and half. Bring to a boil, then reduce heat to low and simmer for 20-30 minutes, until potatoes are tender. Stir in the parsley and more salt and pepper, if desired. If you want a smoother soup, remove about half of soup to a blender and puree, then return to the pot. You can also use an immersion blender or hand potato masher to slightly mash some of the potatoes in the soup. Serve hot. Potato Leek Soup with Sausage: While soup is cooking, crumble and brown 1 pound of Italian sausage. Drain excess fat. Stir into finished soup. Some day, I will get a chance to try making my own pasta. 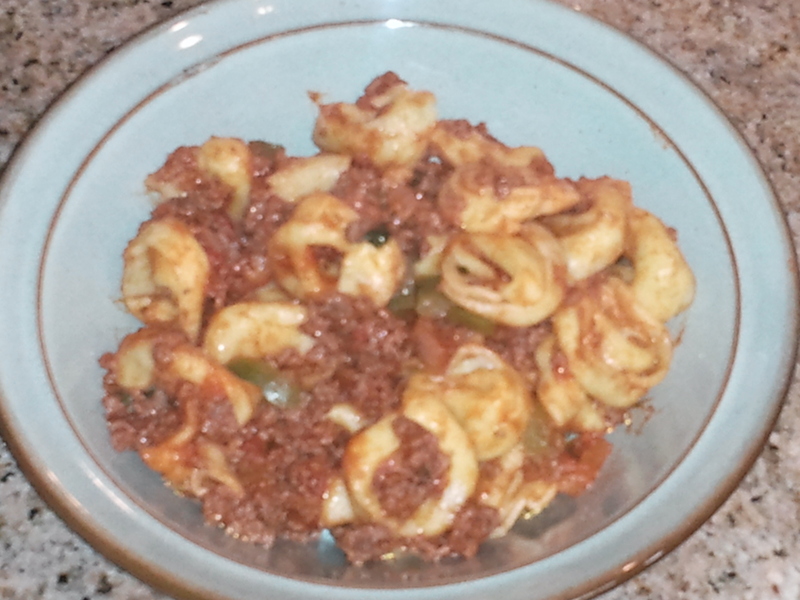 For now, one of our favorites is tortellini, and I normally get the Six Cheese Tortellini from Schwan’s. I normally use a jar of tomato sauce with this, but since I had tomatoes, green peppers, and onion from Bountiful Baskets, I decided to make my own sauce. I didn’t really do any measurements, just added in as I went. It turned out pretty good! In a large skillet, brown ground beef. Add garlic, onion, green pepper, and parsley. Cook until onions and peppers are soft. Add sliced tomatoes, tomato paste, oregano, salt, and pepper. Crush tomatoes as they cook. Let simmer for 15 – 20 minutes. Serve with your favorite pasta. This meal is so easy. Sometimes, I add some fresh or dried parsley, but decided to skip it this time. I served this over white rice, but it would be good over wild or brown rice too. Or, you could serve it over pasta of your choice. I’ve served it over angel hair pasta, and they went really well together. A vegetable like broccoli, asparagus, or green beans goes well with this. In a large skillet, saute the shrimp and garlic in butter for 5 minutes or until shrimp turn pink. Add the lemon juice and parsley, if using; heat through. Serve with rice. 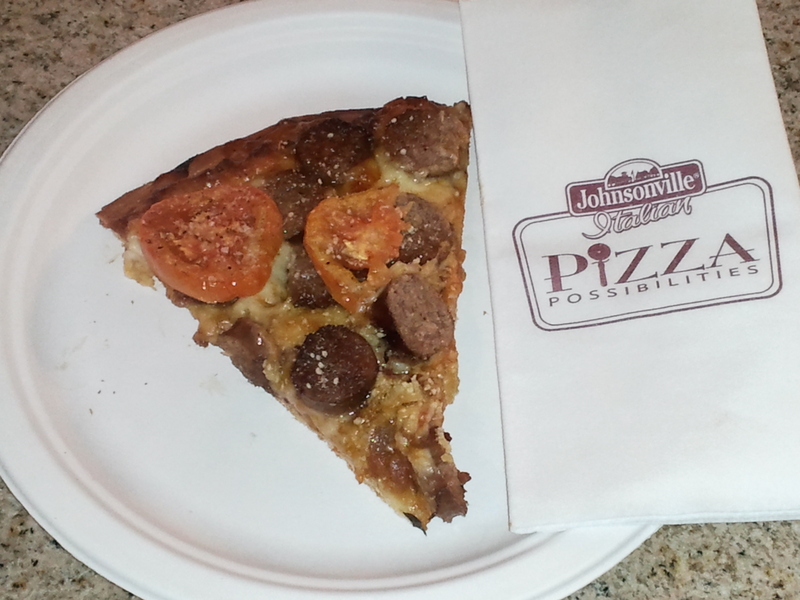 Back in January, I talked about a Johnsonville Pizza Possibilities House Party I had won a while back. This pizza recipe is another recipe from the book that came in the party box. I used some fresh spices, red onion, and tomatoes I had gotten from Bountiful Baskets to make this. It was very good, a lot of sausage, but I think it’s one of those recipes you can add more or less sausage to. Put oven rack on lowest shelf and preheat to 425 F.
Lightly oil a pizza pan. Roll out dough as thin as possible. Let rest 10 minutes. In a large skillet, heat 1 tablespoon oil and cook sausage until browned. Always cook sausage to internal temperature of 160°F. Remove from pan and slice. In the same pan, cook onion and parsley to golden, then stir in garlic and oregano for a few seconds. Add tomatoes to pan, crushing them as they are mixed (do not substitute crushed tomatoes). Boil, stirring 5 minutes or until thick. Spread sauce over crust, sprinkle with half the basil, Mozzarella, Fontina, sausage, and the remaining slices of tomatoes. Spray with olive oil. Sprinkle generously with pepper, then with a little sea salt. Bake for 10 minutes. Using a spatula and an oven mitt, slip the pizza off the pan directly onto the oven rack, bake for two minutes. Slip pizza back onto pan, remove from oven. Or, I just baked for 12 minutes on the pan. Sprinkle with the remaining fresh basil and Parmesan cheese, cut and serve. 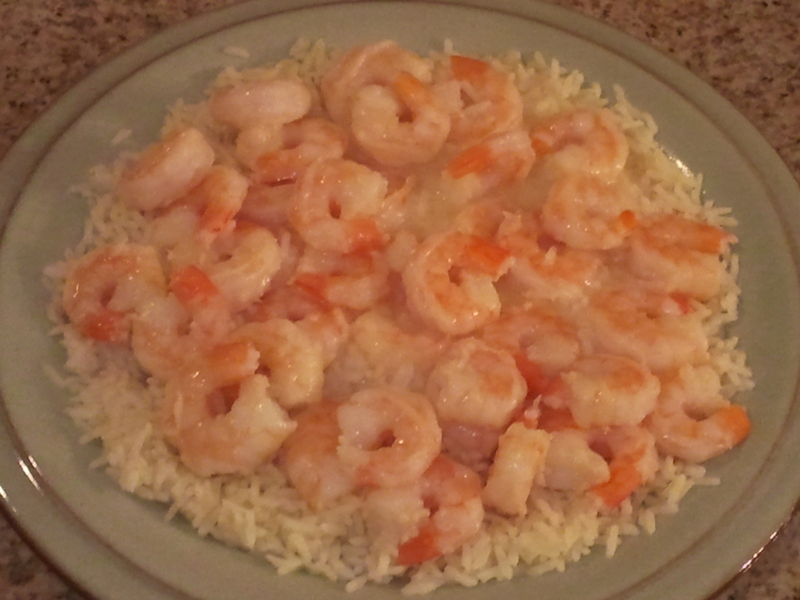 Tonight I used the first of the Zaycon Foods seafood that I got recently, 1 pound of the white shrimp. The shrimp is deveined and fully cooked, so I just thawed it by running cold water over it, then removed the tails. 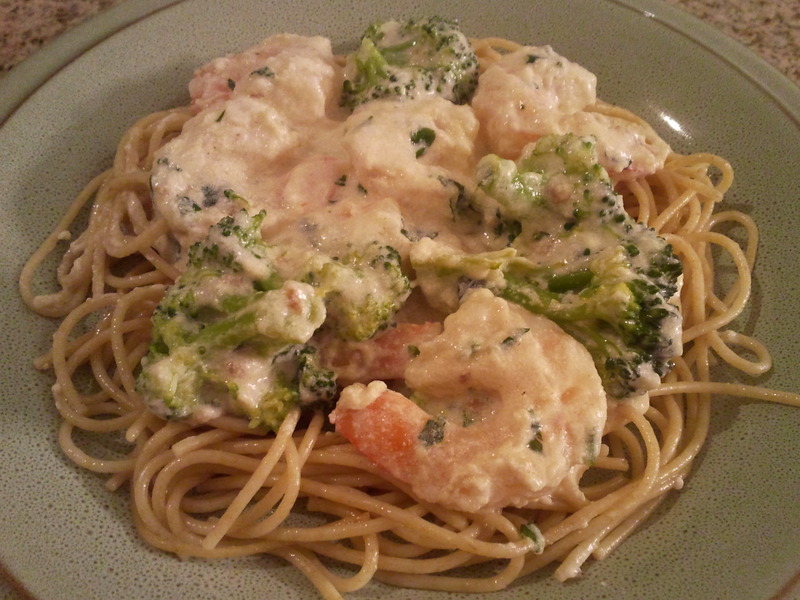 I made some Alfredo Sauce using fresh garlic and parsley from the Italian themed veggie pack from Bountiful Baskets, added in the shrimp at the end, along with some broccoli from Bountiful Baskets that I had steamed. It was very good. The shrimp was very tasty, nice large, quality shrimp. I served it over thin spaghetti, but the shrimp and broccoli with sauce was enough to eat just on its own, without noodles. I will probably try a Garlic Butter Shrimp next, or maybe something with the cod. So nice to have some seafood in the freezer to use for meals! This wasn’t in the original meal plan for this week, but since I wasn’t feeling well earlier this week, I fell behind in cooking and had some things I needed to get cooked before they went bad. So, I decided to make Chicken Marsala, something we haven’t had in a while. For the sides, I steamed my last bunch of asparagus and made mashed potatoes with a partial bag of potatoes I had left. Since I have herbs from the Italian themed veggie pack, I added crushed fresh garlic and minced fresh rosemary to the mashed potatoes. It was a nice addition. 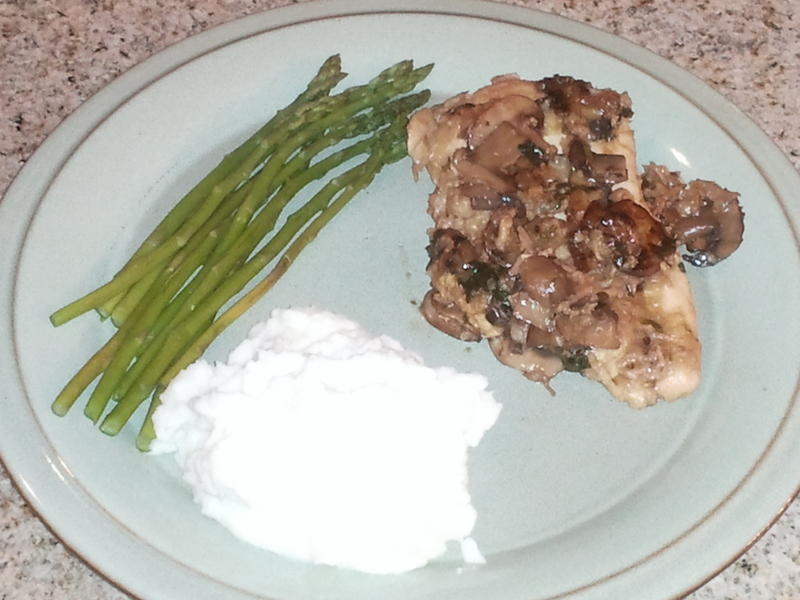 I also got to use the fresh herbs in the Chicken Marsala. Pound chicken to 1/4 inch thickness. Mix together flour and oregano, and fully coat chicken with this mixture. Heat the olive oil in a large skillet. Add chicken and cook until no longer pink. To the skillet, add and melt butter. Add mushrooms, wine, parsley, and rosemary. Bring to a boil, then reduce heat to a simmer. Cover, and cook for 5 minutes. Flip chicken over, cover again, and cook for another 5 minutes. Remove cover and simmer until sauce has reduced by half. Part of the fun of participating in Bountiful Baskets is that it’s a surprise what will be in the baskets each week, and there is a bit of variety. And, it’s always more fun when you get something you’ve never seen or heard of before. This week, the element of surprise was a dozen, small Jerusalem artichokes, sometimes referred to as sunchokes. Despite having artichokes in the name, they are really nothing like artichokes you normally see. Instead, they are a tuber, and look similar to other roots, like ginger. I came across this recipe on the Bountiful Baskets Facebook page, and decided it was probably the best way for us to try these out. It turned out really good, it was a nice mix of the almost nutty flavor of the sunchokes and potatoes, cheese, and spices. Thank you to Bountiful Baskets for giving us something new to try! Put the sliced Jerusalem artichokes and potatoes in a mixing bowl. Toss with 2 tablespoons of the olive oil, and season with salt and pepper. Grease the bottom and sides of a 2 quart casserole dish (I used an 8×8 glass dish). Put half of the artichoke-potato mixture in the pan, spread evenly along the bottom. Then, sprinkle with 1/4 cup diced onions, 1 teaspoon minced garlic, 1/2 cup shredded cheese, and all of the flour. Put in the remaining artichoke-potato mixture, spread evenly. Sprinkle with the remaining 1/4 cup diced onions, 1 teaspoon minced garlic, and 1/2 cup cheese. Pour the milk evenly over the whole dish. In another bowl, mix together the remaining 2 tablespoons olive oil with the bread crumbs and parsley. Spread this topping evenly over the mixture. 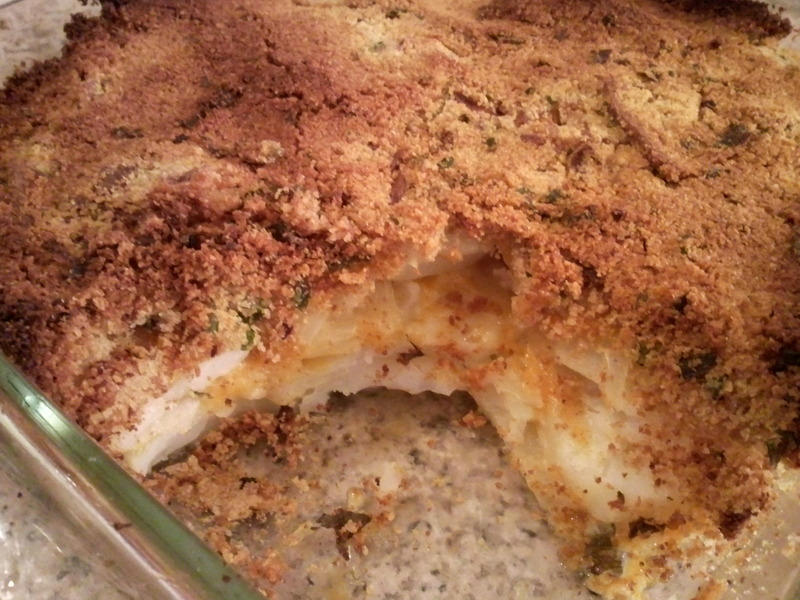 Bake in the preheated oven for 1 hour, or until the potatoes are tender.